A virus is a smaw infectious agent that replicates anly inside the livin cells o ither organisms. Viruses can infect aw teeps o life forms, frae ainimals an plants tae microorganisms, includin bacteria an archaea. ↑ Koonin EV, Senkevich TG, Dolja VV. 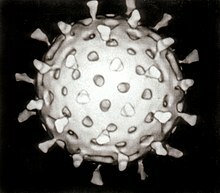 The ancient Virus World and evolution of cells. Biol. Direct. 2006;1:29. doi:10.1186/1745-6150-1-29. PMID 16984643. This page wis last eeditit on 11 Februar 2017, at 01:41.